BILOXI, Miss., Sep. 13 /CSRwire/ - Smithfield Foods, Inc. joined with Southern Event and Party, Pleasant’s BBQ, Wildes Tavern, and Overtime Sports earlier this year to break the current Guinness World Record for Largest Serving of Pulled Pork. 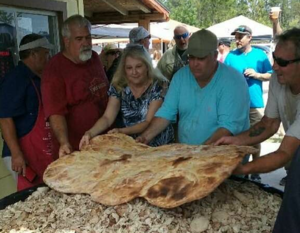 The previous record was set by Sonny’s BBQ in 2016, weighing 2,012 pounds. In August, the Records Management Team from Guinness World Records officially recognized the attempt to top the previous record, weighing 2,390 pounds. The world’s largest serving of pulled pork, made from Smithfield Fresh Pork Boneless Loins, was then served to Shepherd of the Gulf, #DoMore Pantry, and local first responders providing more than 2,000 meals to community members in need. Smithfield Fresh Pork is available at Walmart and your local grocer in a variety of hand-trimmed cuts, including: St. Louis Style Spareribs, Back Ribs, Tenderloins, Shoulder Butts, Boneless Loins, Boneless Shoulder Picnic Roasts, and Center Cut Loins. Smithfield’s contribution was part of the company’s Helping Hungry Homes® initiative. Since founding the program in 2008, Smithfield has provided more than 100 million servings of protein to food banks, disaster relief efforts, and community outreach programs nationwide. Smithfield Foods is a $15 billion global food company and the world's largest pork processor and hog producer. In the United States, the company is also the leader in numerous packaged meats categories with popular brands including Smithfield®, Eckrich®, Nathan's Famous®, Farmland®, Armour®, Farmer John®, Kretschmar®, John Morrell®, Cook's®, Gwaltney®, Carando®, Margherita®, Curly's®, Healthy Ones®, Morliny®, Krakus® and Berlinki®. Smithfield Foods is committed to providing good food in a responsible way and maintains robust animal care, community involvement, employee safety, environmental and food safety and quality programs. For more information, visit www.smithfieldfoods.com, and connect with us on Facebook, Twitter and LinkedIn.